Minimally invasive laparoscopic procedures have become the common approach for most of the abdominal operations. This method utilizes several small incisions, ¼” to ½”, instead of one large incision. Surgeons at Atlanta General and Bariatric Surgery Center have extensive training in advanced laparoscopic surgery and commonly utilize this technique for bariatric procedures, Nissen fundoplications (reflux), gallbladders, hernias, colons, and many other more complex procedures. Our surgical center is equipped with the latest in laparoscopic technology. Your surgeon will be happy to talk with you to see if you are a candidate for a laparoscopic procedure. 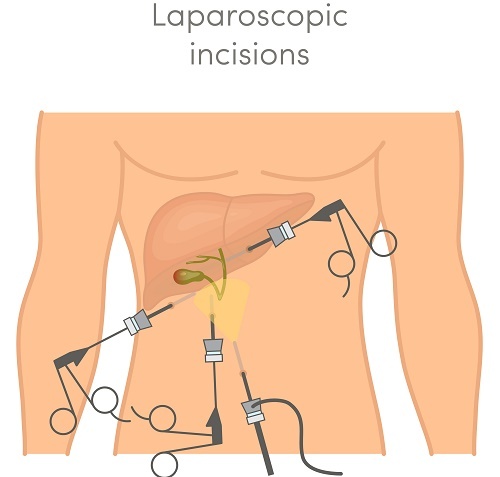 The incision examples below show how laparoscopic and open surgery differ. Atlanta General & Bariatric Surgery Center located in Johns Creek, GA, attracts patients from all over the metro Atlanta area and beyond including Suwanee, Berkeley, Norcross, Dunwoody, and Oakwood, GA. Our board certified surgeons, Dr. Christopher J. Hart, Dr. William H. Johnson, or Dr. Michael Williams medical procedures or surgeries that do not require an overnight stay. We do have a great number of patients that do travel long distances and need hotel accommodations. We have put together information about staying in our area.